Activists on Thursday gathered outside a hotel in Orlando, Fla., to protest Donald Trump and U.S. Sen. Marco Rubio (R-Fla.) over their scheduled appearances at an anti-LGBT conference. Supporters of Equality Florida, a statewide LGBT advocacy group, and other activists specifically criticized Rubio for his decision to deliver the keynote address at the “Rediscovering God in America” conference that began on Thursday. The American Renewal Project is organizing the two-day gathering that is taking place at the Hyatt Regency Orlando. Mat Staver, chair of the Orlando-based Liberty Counsel, an anti-LGBT legal group that represented Rowan County (Ky.) Clerk Kim Davis, is among those who are scheduled to speak at the conference that is taking place two months after a gunman killed 49 people at the Pulse nightclub. Bill Federer, who said in 2015 that Europe will soon be “taken over by Islam” because it has embraced a “neutral-secular-gay agenda,” is also expected to address the hundreds of people who are expected to attend. Trump is expected to speak at the conference on Thursday. 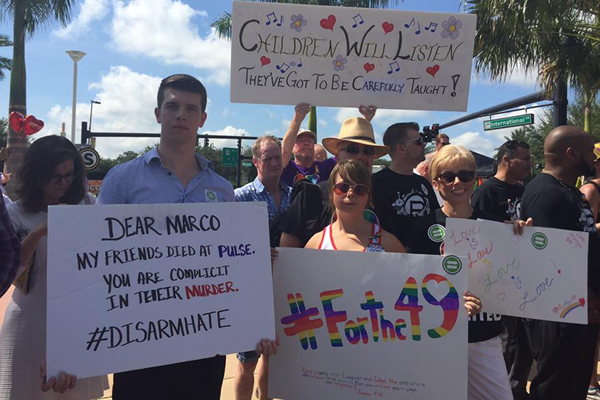 “We will never allow bigotry and hatred to go unchecked in our backyard,” Hannah Willard of Equality Florida told the Washington Blade after a press conference at which family members of the Pulse nightclub massacre victims, local activists and clergy spoke. The hotel in which the conference is taking place is located roughly 10 miles from the Pulse nightclub. The gunman — an American who was born to parents from Afghanistan — pledged his allegiance to the so-called Islamic State during the massacre. His father, who attended a Hillary Clinton rally in Kissimmee, Fla., earlier this week, told reporters that his son had recently become “very angry” when he saw two men kissing in Miami. 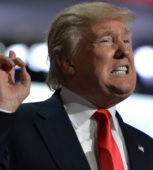 Trump reiterated his calls to temporarily ban Muslins from entering the U.S. in the wake of the June 12 massacre that is the deadliest in recent U.S. history. The Republican presidential said during a rally in Fort Lauderdale, Fla., on Wednesday that President Obama “founded” the so-called Islamic State. Rubio, who has endorsed Trump, defended his decision to speak at the conference in a statement to the Tampa Bay Times. The conference is taking place roughly two weeks after Christine Leinonen, the mother of Christopher “Drew” Leinonen, one of the gay victims of the Pulse nightclub massacre, spoke in support of gun control during an emotional speech at the Democratic National Convention in Philadelphia. Orange County Mayor Teresa Jacobs and U.S. Rep. John Mica (R-Fla.) are among the Republicans who have signed a resolution in support of banning anti-LGBT discrimination in Florida. Orlando “El Fenómeno” Cruz, a gay Puerto Rican boxer, dedicated a fight to the victims of the Pulse nightclub massacre that took place in Kissimmee, Fla., on the eve of last month’s Republican National Convention in Cleveland. Clinton placed a bouquet of flowers at a makeshift memorial outside the Pulse nightclub on July 22 after she met privately with some of the family members and friends of the massacre victims and local advocates. House Minority Leader Nancy Pelosi (D-Calif.) is scheduled to visit the site on Thursday and meet with those who lost loved ones. A Trump campaign spokesperson has not returned the Blade’s request for comment on the conference or whether he plans to visit the Pulse nightclub. That would be “proportion,” singular. In any event, you may think that concern about the bigotry-based conference is unnecessary, but most Americans believe, rightly, that these politicians are demonstrating support for precisely the kind of bigotry, intolerance, and hatred that this “faith-based” conference represents. You are an idiot. Even the KKK would claim to be a “faith-based” organization” when in fact they are a hate-based organization — And Trump is turning the Republican Party into a hate-based party, as his rallies continue to resemble the infamous Nuremberg Rally.